Over Easter weekend, I went to visit my good friends Mark and Stephanie who live in AL. It’s become a regular tradition for us over the last few years. 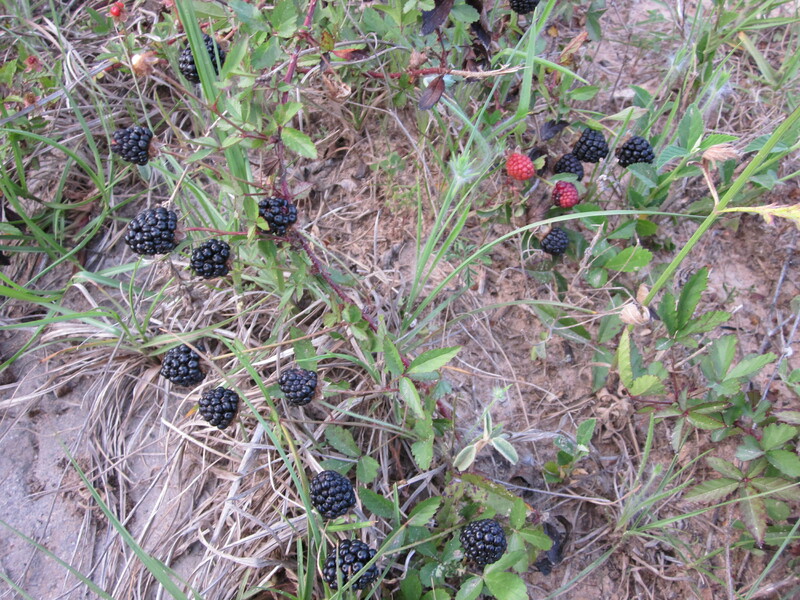 This year was different because Easter was later in the month of April which meant it was <cue drum roll> dewberry season. The last two times I’ve visited, it has been just at the beginning of the season when the dewberry flowers are appearing. Mark always shows me the white flowers along the roadside and says, “There and there and there will be so many dewbs. It’s a shame you won’t be there to help pick them.” Well, this year, I was there to pick them. Honestly, I wasn’t sure there were berries to pick because I couldn’t tell where the berries were. The trick seems to be to watch where the white flowers appear, make note, and then a few weeks later go to the same spots to pick the berries. We went on Easter Sunday to pick the berries, and it was my first-ever berry-picking experience. I was quite enamored with the whole thing. We picked for 30 minutes and got about 3 quarts of berries between the 2 of us. What do you do with dewberries, you might ask? 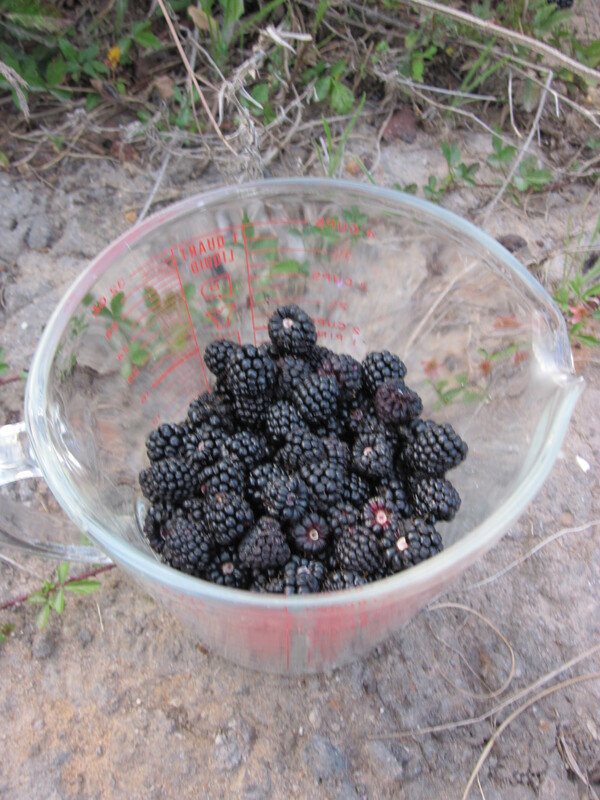 Well, Mark made a dewberry cobbler which is below for your making as well. It’s ridiculously easy and ripe for substitutions, so get to the makin’, my friends! 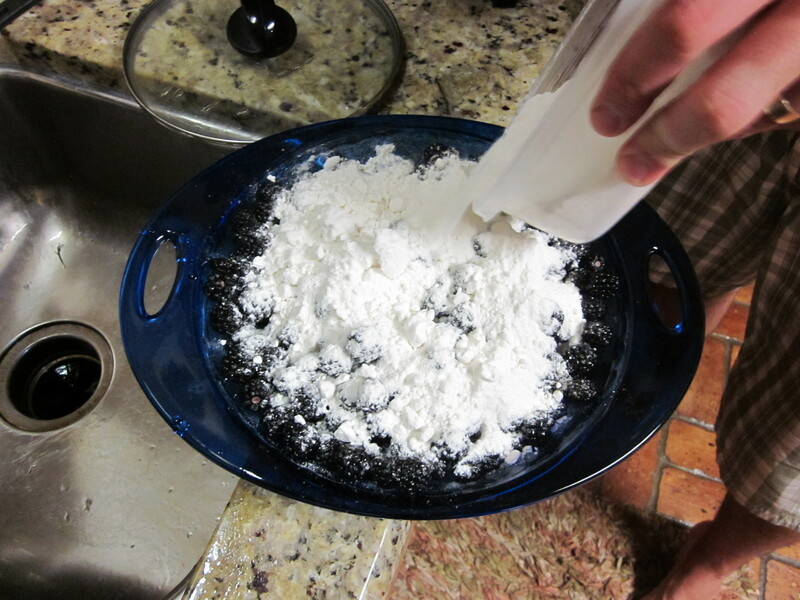 Enough cake mix to cover the berries. I recommend white, vanilla, butter, or almond, if you can find it. 2. Rinse your berries. This is crucial as they’ve come straight from the outdoors. Let drain for a few minutes. Pick over to make sure you don’t have any detritus from the outdoors. This does not make good eats. 3. Pour berries into pan. You want to cover the bottom. They don’t need to be in a single layer, but I wouldn’t go for more than a double layer. 4. 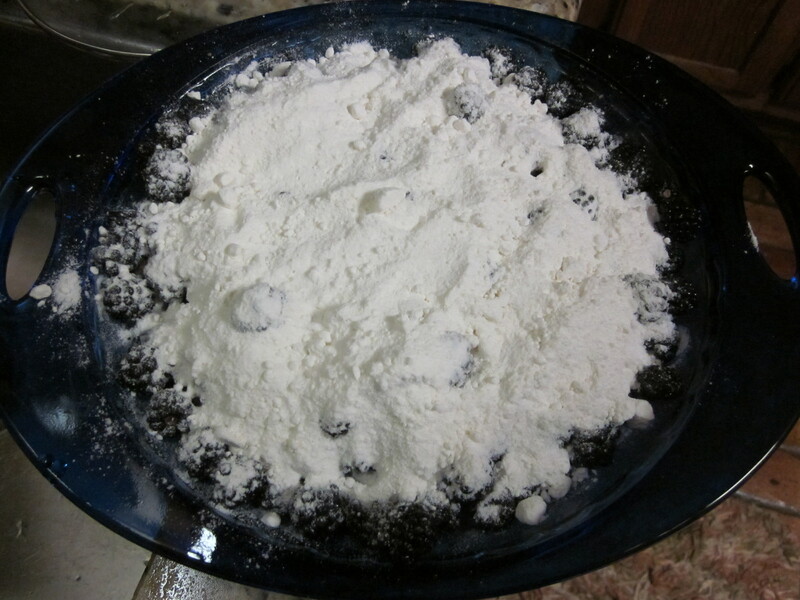 Using your preferred flavor of cake mix, shake enough dry mix on top of the berries. It doesn’t need to be neat or absolutely all the way over to the edges. You do want to cover most of the berries, though. 5. 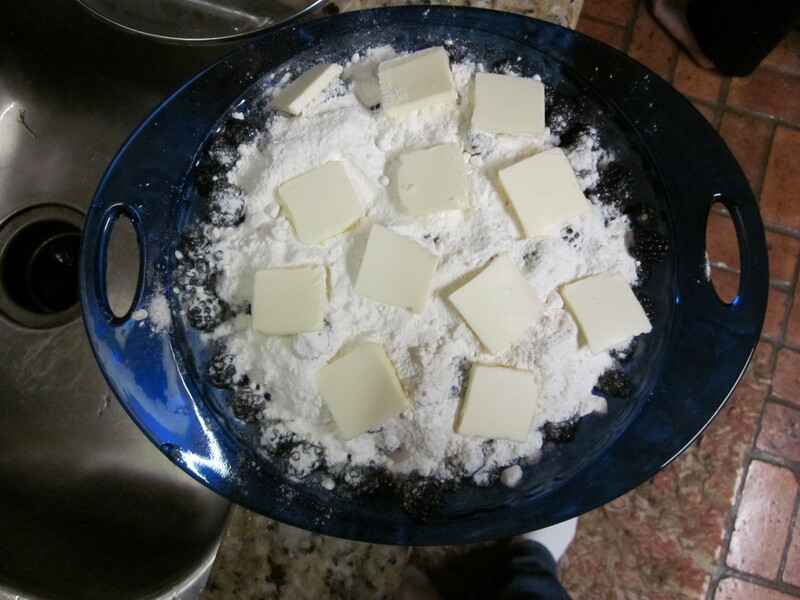 Cut pats of butter, and place randomly across the cake mix. They should be somewhere between so thin they break apart immediately and crazy thick. Mark used 12 pats. 6. Cover with foil, and cook for 45 minutes. 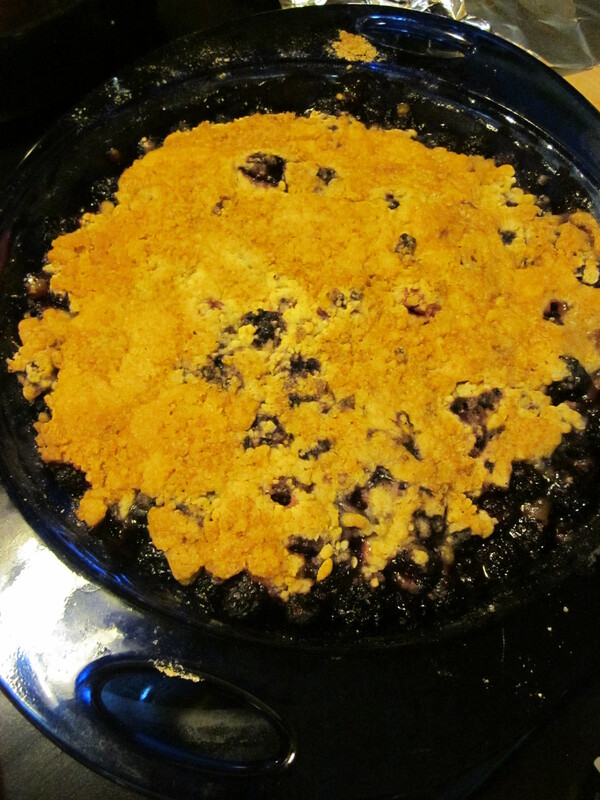 Check and see if the topping is browned and the berries look broken down and juicy. If not, leave in a few more minutes. 7. Let cool a few minutes when you take it out. Serve with ice cream or whipped cream or just by itself. Honestly, when Mark started the process, I was confused because I thought he needed to make a crust and all that jazz. I was mistaking cobbler for pie, it seems. 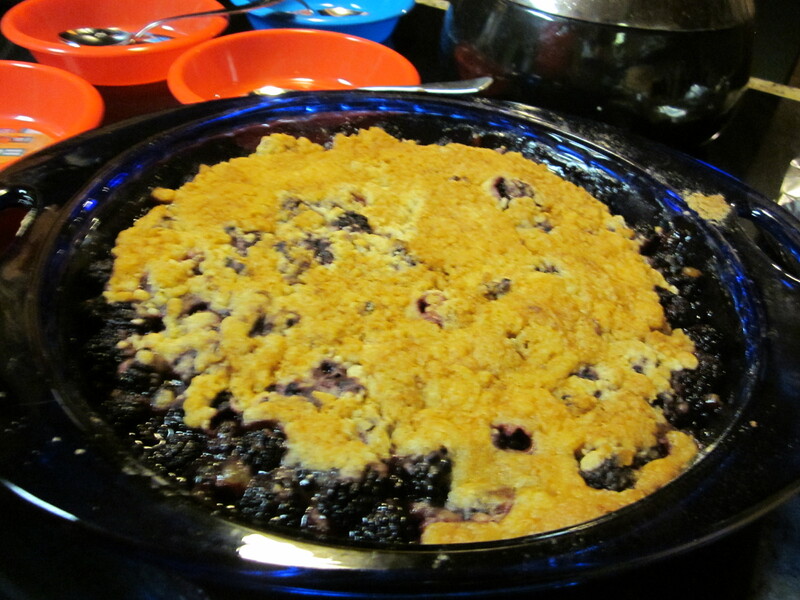 A cobbler does not need a bottom crust and does not regularly have a lattice top or the fully covered top with cut-outs that I was envisioning. This is much simpler! I may be cobbler’s new biggest fan! 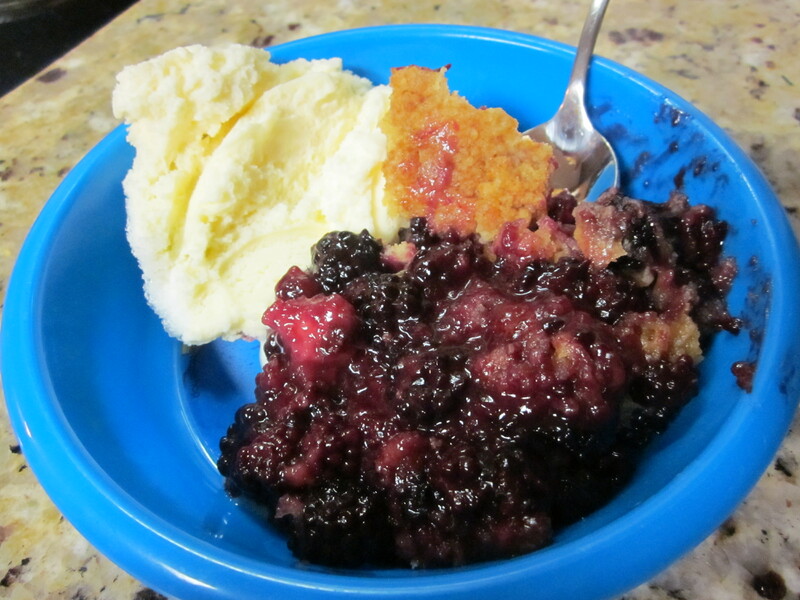 I made this when I got home with my dewberries and just made a personal-sized cobbler. It was super easy. I used less than 1/2 cup cake mix and about a tablespoon or so of butter and ate it with ice cream, right out of the dish. When you are eating dessert for one, why not?? I’m contemplating making it with strawberries or peaches next. 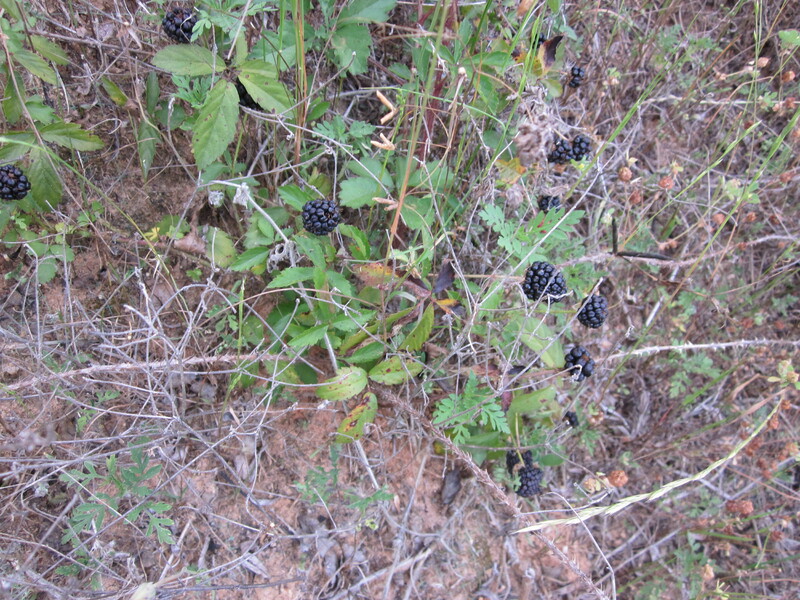 You may be asking, “What the heck is a dewberry? ?” I’d never heard of them before my friends moved to Alabama either. They are a relative of the blackberry, only smaller. They grow on ground-crawling vines with wee thorns. You have to be very, very careful when picking them so as not to get pricked. I was not always successful, honestly. Before we left the house, Mark said he always goes berry picking in shorts and sandals. This woman went in long pants and closed-toed shoes. I’m pretty thankful that I did. 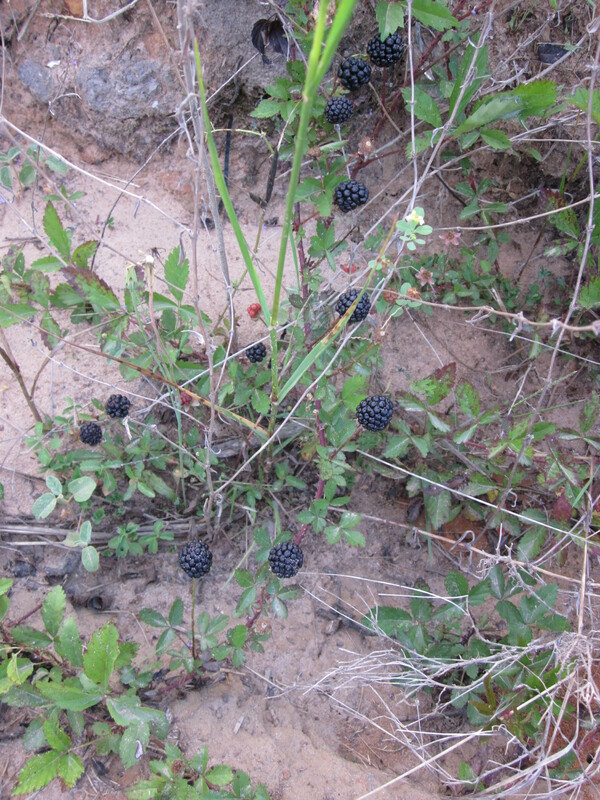 It made me brave enough to get closer to clusters of berries that were just calling my name. In fact, I’ve still got some splashes of smushed berries on the side of one of my shoes. 🙂 The berries do fall apart pretty easily so your fingers get stained post-haste. I think they are quite tasty, so I’m glad I finally got to try them. 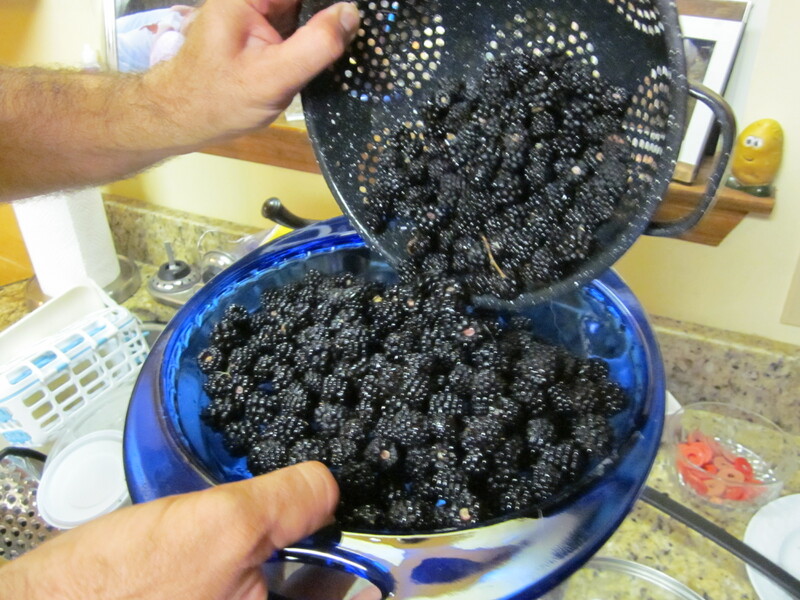 Mark is quite the industrious berry picker and makes dewberry cobblers, jams, wine, and who knows what all else? He’s a wizard with that kind of thing. It does seem to me that if you can find any sort of produce free on the side of the road in your neck of the woods, you should DEFINITELY take advantage of it. 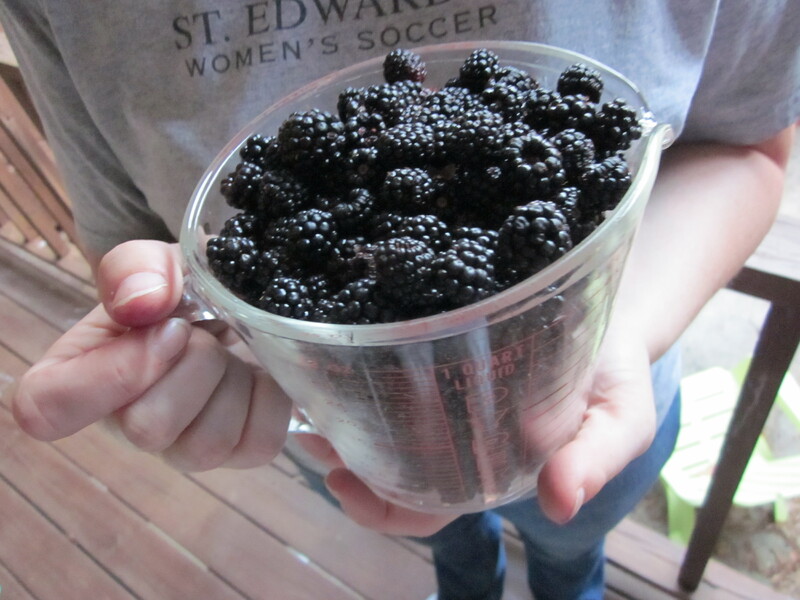 I came home to pints of blackberries in the grocery store for nearly $4. Seriously? I just picked a quart of them for free in 30 minutes. That’s a serious impact on one’s grocery bill. Maybe it’s not berries in your area. Maybe it’s pecans. Maybe it’s peaches. Maybe it’s apples. I honestly don’t know what it is in my own area, but I want to find out. 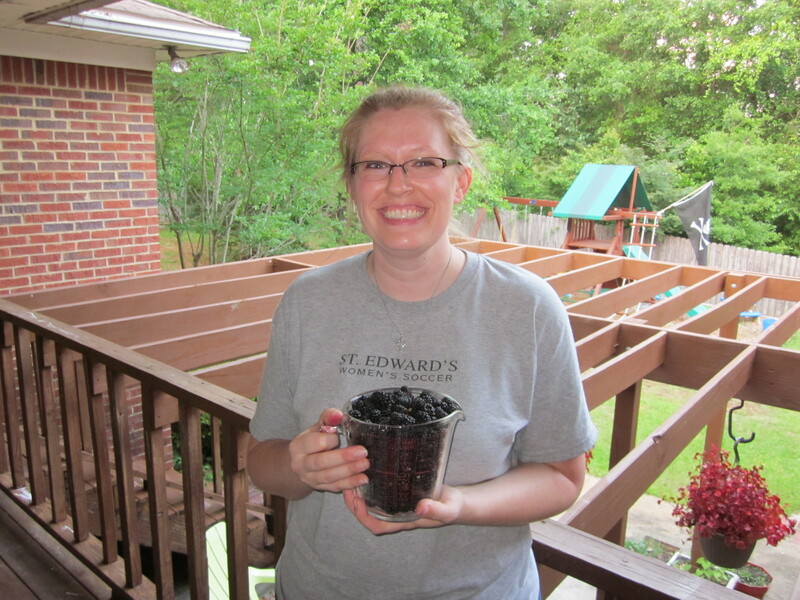 Please enjoy pictures of my dewberry picking experience! As a small plug, Mark has also started beekeeping and has made his own chapstick. Check it out here! I would love to hear about it if you made your own cobblers with different ingredients. Leave a comment, or follow me on Twitter and tell me about it there. I’m at lettherebefood. Can’t wait to hear your stories. Happy eating! I have a ton of blackberries and strawberries in my fridge… I think I might be making this happen soon. so do they taste like black berries? Is the cake mix you are referring to like the boxed cake mix I buy for like 2 bucks from the store? This sounds like an amount of effort for cooking that I can support.